800 higher in FIVE DAYS? DO YOU EVER TAKE PROFITS? Bullish or SELL the news? Be Skeptical my Farmers. When you have that bad bad trade on that gives you a chance to break even? I say take it and not look at it. That would be hard in this case. You want a broker that will tell you this. THIS is where we want to move. I have olive sells in hogs, HEQ 85.72 tight stop 87.42 next if over. Expect high impact levels to play. Name a crop that didnt get planted? Ok old timers its time for you to give me a holler. Its a trader, bro in law story trader story clients get that color free. Cattle has me concerned for longs. Watch for fund liquidation, a service and lesson I learned from Tudor. Stocks- WLY tells me shorts blowing out left and right. Little 1,000 lot guys. Yeah, old 200 lot traders. Feel small? We are. Scale up LC but be ready to flip. Bullish dope LC for all you farmers that think way the mofuToo much. CPI inflation- remember I and mkts can lie but the service sector inflation is red lining a dive Fed FRB at 2.1%. Blistering and probably going higher for now. Wsj Ohio hires Puerto Ricans fir $12hr and get this, boss mad, they speak NO English. Idiosa's? So wages are going to People that EAT MEAT. HOGS- EXPLOSIVE over 85 but this good sell level 1st time up. $1.05Hogs? Heck yes no that we crushed OL Victims when we high impact spike panic chaos (bloom word using 24 hr.s now) 53 now five nanoseconds later we got higher on yr in one. My take is 90% of my rural producers do no homework as far as charting or trading. You trade like an emotional basketcase listening to that brainwashing blather they spoon feed you. Forget the screen which are feeder auctions daily. Don't be the gold mans hood ornament. Options two weeks left for lotto players. I like my S&P whale trader do not need to understand the situation. If we lose money after 10am we DO NOT TRADE THEN. If you don't get it? Then consider coming over here and get an education in charts, trading rules, setup's that have played in wheat well so far and we might, I think we are Hogs last month. 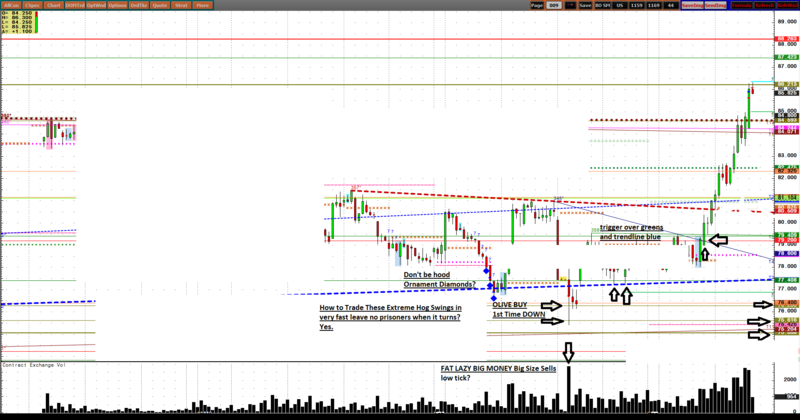 Trade the pattern setups like a green sell CTK is it by the buck, wed.s high. Off tick. Buy stops over. Sell # hit. I write in am, and do not look at all. Just wheat and its game on. 441 was sweet kiss, 440 I mentioned weeks ago KWN. Shorts are short and this is, might rally big. Scale buy in case they break into Month end but buy it then also. I like wheat 551 that 1st time miss by 1/2c, remember my new low stops into an OLB, bounced 9, hit 441 bounce 20c, hit 431 close your eyes double up long MOC MARKET ON CLOSE. 99% do not know. Jez Loise. Those are your pivots. If 20 lot max unit? Scatter the field at my lines and levels, 4.35 huge also, off Old highs, we kissed a day. One day of heat in a trade you hated, despised. I think that was low. Dollar? Stop, your going to burn your brain out listening to that. Who do you think they are trying to hook? Trust me, its you. LIKE NOW. Do you think you listen to UK Brexit garbage? No. Listen to me or you may go broke on bad dope (opioids 74k now) which is auctions, china but now Im ready and bullish hogs. Buy any sharp break and if US gets it? Call for an olive in that brief panic down. Then look for a buck. Option Huge player was buying LH calls and selling puts (high octane loser if wrong) and BUYING APRIL PUTS. This was like the 10000 call guy in corn last year by low. Where those 345 puts and if so where are we? LH- Pushing down (Buy puts) on J like G during crash and BUY M, Q calls? Hey CME guys how much. The Hog Hook may be set. To me the right people are long now for a squeeze to upside. All time highs can not be ruled out with China going forward. This is why you need to blow out old cash grain and finance that exposure in futures with me. KWN 460c 104 days? Up 50% in 1day, not bad, didnt back off as much on break. Do not walk with wheat. Scale buy my big pivot macro levels and make them prove you a loser here at my 440, 418 U. WN ? 4.3 ? 4? The olive line Bandit? SNKWN hit a OLS, +.45 folks on this $3.00rally Beans gain on Wheat? Sell beans buy wheat but this is HFT territory. I will put my 30 year chart in this spread against the best. AUGUST HOG TOP at an OLIVE Sell 1st time up? It's just a trade with a stop over. Lines play. Its what data feed you use in trading. You can still get delayed. My trading strategy is based longer term within shorter time intervals. For example, a 60min TL will be different than a 44 min chart right? If my line hits and somebody starts buying 10 lots like KWN, and WN Im sure on gaps at specific times that are Masonic in nature (A Dr, buddy, trader, star gazer) which is what my buddy described them as. Where I give you what I think you will walk away and say hey. I will wait to buy firesale (HJ 53, KWN 440) and I can bang em for 25c fast and run flat that day you get paid. Good job to those that did and bought against 441 yest. Lock and load but reload like a catfish in water now. I'm guessing bullish news, weather coming. Buy hog necklines open orders, and educated risk stops of Pro stop searcher of old. That why I think Im good with clients that have no access to professional trading boutique services. Bottoms are, might be in. Stocks have a very rare pattern of mine that happening in different time durations. If you want to trade stocks my leak late indicator will come around some day. Best Always.